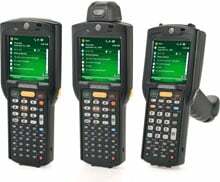 Wi-Fi (802.11a/b/g), Gun-Grip, 1D Laser Scanner, 48 key Alphanumeric Keypad, High Capacity Battery, Bluetooth, Full Audio, 1D Laser Scanner, Color Touch Display, Windows CE 6.0 Pro, 256MB RAM/1GB ROM, English. Interface cables and charging cradle sold separately. For the full kit see (Part# MC3190-GL4H04E0A-KIT). Wi-Fi (802.11a/b/g), Brick Straight Shooter, 1D Laser Scanner, 48 key Alphanumeric Keypad, High Capacity Battery, Bluetooth, Full Audio, Color Touch Display, Windows Mobile 6.5 Classic, 256MB RAM/1GB ROM, English. Cables and Charging Cradle Not Included. For the full kit see (Part# MC3190-SL4H24E0A-KIT). Brick Straight Shooter, 1D Laser Scanner, 48 key Alphanumeric Keypad, High Capacity Battery, Wi-Fi/Bluetooth, Full Audio, Color Touch Display, Windows CE 6.0 Pro, 256MB RAM/1GB ROM, English. Cables and Charging Cradle Not Included. For the full kit see (Part# MC3190-SL4H04E0A-KIT). Brick Straight Shooter, 1D Laser Scanner, 38 key Alpha Shift Keypad, Standard Capacity Battery, Wi-Fi/Bluetooth, Full Audio, Color Touch Display, Windows CE 6.0 Pro, 256MB RAM/1GB ROM, English. Cables and charging cradles not included. Brick Straight Shooter, 1D Laser Scanner, 38 key Alpha Shift Keypad, High Capacity Battery, Wi-Fi/Bluetooth, Full Audio, Color Touch Display, Windows Mobile 6.5 Classic, 256MB RAM/1GB ROM, English. Cables and Charging Cradle Not Included. For the full kit see (Part# MC3190-SL3H24E0A-KIT). Wi-Fi (802.11a/b/g), Brick Straight Shooter, 1D Laser Scanner, Windows CE 6.0, 38 key Alpha Shift Keypad, High Capacity Battery, Bluetooth, Full Audio, Color Touch Display, 256MB RAM/1GB ROM, English. Interface cables and charging cradle sold separately. For the full kit see (Part# MC3190-SL3H04E0A-KIT). Brick Straight Shooter, 1D Laser Scanner, 28 key Numeric Keypad, Standard Capacity Battery, Wi-Fi/Bluetooth, Full Audio, Color Touch Display, Windows CE 6.0 Pro, 256MB RAM/1GB ROM, English. Cables and charging cradle not included. Brick Straight Shooter, 1D Laser Scanner, 28 key Numeric Keypad, High Capacity Battery, Wi-Fi/Bluetooth, Full Audio, Color Touch Display, Windows Mobile 6.5 Classic, 256MB RAM/1GB ROM, English. Cables and Charging Cradle Not Included. Brick Straight Shooter, 1D Laser Scanner, 28 key Numeric Keypad, High Capacity Battery, Full Audio, Color Touch Display, Windows CE 6.0 Pro, 256MB RAM/1GB ROM, English. Cables and Charging Cradle Not Included. For the full kit see (Part# MC3190-SL2H04E0A-KIT). Brick Straight Shooter, 2D Imager, 48 key Alphanumeric Keypad, Standard Capacity Battery, Wi-Fi/Bluetooth, Full Audio, Color Touch Display, Windows CE 6.0 Pro, 256MB RAM/1GB ROM, English. Cable and charging cradle not included. Wi-Fi (802.11a/b/g), Brick Straight Shooter, 2D Imager, 48 key Alphanumeric Keypad, High Capacity Battery, Bluetooth, Full Audio, Color Touch Display, Windows Mobile 6.5 Classic, 256MB RAM/1GB ROM, English. Interface cables and charging cradle sold separately. For the full kit see (Part# MC3190-SI4H24E0A-KIT). Wi-Fi (802.11a/b/g), Brick Straight Shooter, 2D Imager, Windows CE 6.0, 256MB RAM/1GB ROM, 38 key AlphaShift Keypad, High Capacity Battery, Bluetooth, Full Audio, Color Touch Display, English. Interface cables and charging cradle sold separately. For the full kit see (Part# MC3190-SI4H04E0A-KIT). Brick Straight Shooter, 2D Imager, 38 key Alpha Shift Keypad, High Capacity Battery, Wi-Fi/Bluetooth, Full Audio, Color Touch Display, Windows Mobile 6.5 Classic, 256MB RAM/1GB ROM, English. Cables and Charging Cradle Not Included. For the full kit see (Part# MC3190-SI3H24E0A-KIT). We use these in all phases of product movement in our wholesale distribution center. They read barcodes very well and are pretty durable (surviving minor drops and tumbles). Loading the 5250 terminal emulator software is very simple. The only fault I find with the MC3190s we're buying is the housing material. While still a durable unit, there's no question that the plastic they're using for the housing now is a lighter and more rigid plastic than was used in the MC3090. It concerns me a little that it could be more prone to breakage. It also makes me wonder if they've started skimping on the quality of the internal parts. BUT so far, they're performing and surviving well. We use these in our distribution center primarily for order picking but have also used them in the receiving department. They're super reliable and much sturdier for bumps and drops than they appear. One huge plus for us is that the wireless connection is very reliable, less dropped connections which can always be an issue in a warehouse. I wish we could replace all our other mobile devices with these. We use this model in a Hospital environment for materials managment. We have also used the same model without the gun but we like the gun model better for ease of use. The system comes preloaded/licensed for Wavelink so with very little configuration it is ready to go and with just a short training for our materials or nursing users they are ready to go. We use this in our shipping department to track shipments and to verify the shipments are correct. It is a real time saver, worth evry penny.